Famously known as the 'Queen of Beaches' and a popular hippy hangout, Calangute is Goa's most commercialised and also its busiest beach area. 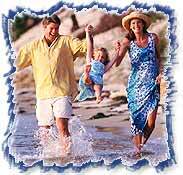 Calangute also owes its discovery to the flower children who settled here in the 1960s from all over the world. This picturesque paradise with its silvery beaches, salt pans, coconut groves and green hillocks now hosts busloads of tourists who come here to soak in the salubrious sea air, pulsating nightlife, inexpensive flea markets and generous helpings of history. The Calangute Church with its massive white dome is a popular landmark in calangute and definitely worth a dekko. The Church of St. Alex was first erected by the villagers in 1595 and is one of the oldest surviving churches in Goa. Stalls and even upmarket stores line the road that connects Calangute with the town, Kashmiri-run handicraft boutiques and Tibetan stalls selling Himalayan curios and jewellery are unique fixtures here. Surprisingly enough the curious sold here are not specific to Goa but sourced from all parts of the country. Calangute's restaurants are grouped around the entrance to the beach and along the Baga road. Seafood is definitely a specialty here and much in demand also though many places tack on a few token vegetarian dishes. Sumptuous western breakfasts also feature prominently. The Kerkar Art Complex, located on the beach, is a popular center for exhibitions of arts and crafts of local artistes. This charming studio-gallery also organises cultural performances by the local artists and students. Tickets are very reasonable and easily available. At Calangute also the nightlife is as hip and happening as can be expected. Numerous bars cater to a variety of tourists and play a wide variety of music. A safe place to swim, this beach offers a wide variety of water sports; choose from parasailing, wind -skiing, and windsurfing. A large number of boat operators also offer dolphin and crocodile spotting trips. Island trips, fishing expeditions and river cruises are all hugely popular. This charming retreat is run by a contemporary artist and even includes an art gallery and a studio where if you so wish you could even paint your own masterpiece. The rooms are simple and filled with paintings, objects d'art, curios and hand painted ceramic tiles, making one feel as if they are in their own private museum. Guests are welcome to make their own meals in the small kitchen here, but for those who don't want to cook, the staff make an excellent Goan curry with freshly caught fish and there are plenty of restaurants and cafes nearby. Just a few minutes walk from Goa's Calangute beach, this retreat combines modest rates with sun, sand and a healthy dose of culture. The rooms are priced between Rs 1,200-3,800. Located on the Calangute beach itself, this hotel is at a distance of 2 kms from the the Calangute Village, 8 kms from the market town Mapusa and about 14 kms from Goa's Capital, Panjim. The hotel provides 68 well furnished rooms, has a swimming pool, a well stocked bar, multicuisine restaurants, a beauty parlour, live bands and cultural shows and the friendly staff here even organise expeditions for the guests. The rooms cost anywhere between Rs 1,800-2,500. All of its 25 rooms have private balconies that offer fabulous views of the Arabian Sea. This family-run establishment has a cozy and intimate atmosphere and its in house restaurant dishes out some of the best sea food in all of Goa. The rooms are priced between Rs 300 - 3,000. Just a stone's throw away from the Golden Eye, the Dona Cristalina is also on the beach and provides comfortable accommodation at more modest rates. The rooms here cost between Rs 250 - 1,200. 16 kms from Panjim, the capital city of Goa Calangute is at the centre of the Bardez coast. 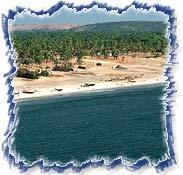 It is bordered by Candolim Beach to the south and Baga to the north. Air - The Dabolim Airport at a distance of 48 kms is the closest to Calangute, a prepaid taxi costs around Rs 600 and transports one easily to the hotel. Rail - The Thivim Station is at a distance of 15 kms and panjim Station at a distance of 16 kms. Taxis charge Rs 250 to transport travellers from both these stations to Calangute. Road - Buses ply between Panjim, Mapusa and Calangute every 15 minutes.